NASHVILLE, TN – (June 30, 2016) – With his heartfelt single “Holdin’ Her” impacting the sales and singles charts, singer-songwriter Chris Janson continues to add milestones to his career. Last week he made a visit to the Country Music Hall of Fame in downtown Nashville to get a personal tour of the ACM Gallery exhibit which contains an entire case filled with Janson items. Each piece of memorabilia played a part in his rise to stardom including boots worn since his early days when he first arrived in Nashville and played shows at Tootsie’s, a Bocephus T shirt, his signature Fender harmonica and a guitar he paid $25 for and calls “the best investment I ever made.” It’s a vintage Yamaha guitar signed by Merle Haggard that Janson wrote all of the songs for his debut album “Buy Me A Boat” on and every song he’s had recorded by other artists. -VIP TABLE PURCHASE DOES NOT INCLUDE ADMISSION TICKETS TO THE SHOW. Prime view of the stage! Whiskey Myers makes honest music. Loud and proud, they sing about what they know with a refreshing directness and clarity. Some call it rebel music, but it’s more like everyday soul. Their songs are stories, with charactersand situations that are immediately relatable. Stories of celebration, mourning, trials and triumph. Through the quality of these songs, and their undeniable power in concert and on record, the band has attracted a devoted army of outspoken fans who pack venues, sing the band’s praises online and continue to make Whiskey Myers a growing word-of-mouth sensation. Ohio’s Winter Werk Out Music & Arts Festival has added a 2-Night Winter Edition! Friday Feb 3rd & Saturday Feb 4th featuring two nights of The Werks + lots more acts to be announced soon! Grab discounted Early Bird tickets now! Werk Out in its 7th year, The Werk Out Music & Arts Festival 2016 is stepping up the Midwest music festival game. While remaining focused on the intimate, fan oriented vibe of the past several years, The Werk Out will play host to some of the top names in the jam and electronica scene. RESERVED TABLE PURCHASE DOES NOT INCLUDE ADMISSION TICKETS TO THE SHOW. I was born and raised Texan, and I’m proud of that. I grew up along with two brothers, a couple of yellow labrador retrievers and parents that stayed together because they loved each other. My life changed when I was 14 years old and decided I would teach myself to play guitar. This was motivated by two things: I thought the guitar would make girls pay attention to me, and George Strait played one. By the time I turned 15, I was performing weekends on small town stages in North Texas, and doing my best as a fan club member to attend every George Strait concert within driving distance. Playing high school football was an important rite of passage for me, along with hunting and fishing, but the dream of a music career consumed me. At age 19, I was satisfied with enough songs I had written to make an album. As a freshman at Texas A&M, I was able to scrape together some studio money by pre-selling the album to friends around campus. For being just a kid, that album did pretty well. It landed me a songwriting deal with EMI Music Publishing in Nashville, and the following year, I took the leap to Tennessee. Through partnerships with artists and strong ties in the music industry, ACM Lifting Lives® develops and funds music-related therapy and education programs, and serves members of the community who face unexpected hardships through its Diane Holcomb Emergency Relief Fund. Through generous donations and the support of artists and fans, ACM Lifting Lives® is able to fund everything from disaster relief and helping communities in need, to music education in schools and music camps for those with disabilities, to supporting programs that use music therapy as a means to help our veterans and wounded warriors, while providing grants to help them ease back into life. The Academy of Country Music and ACM Lifting Lives® have an almost 50-year history of charitable giving and since 2008 ACM Lifting Lives® has given more than $8 million dollars to more than 150 worthy causes and supports many projects throughout the year to create awareness and help those in need. Music defines Chase Bryant. At every level and in often unexpected ways, his truths are expressed in melody, lyrics, hooks and sounds … but his reality goes even deeper than that. Bryant’s heritage is defined by music. His upbringing, his craft, his inspiration and his obsessions are all centered in the same – which is good – because there’s no other way to explain how a 23-year-old Texan could already be a top-flight guitar player, head-turning songwriter, RED BOW recording artist and co-producer of his debut album. DUE TO POPULAR DEMAND, WE’VE ADDED A SECOND SHOW! 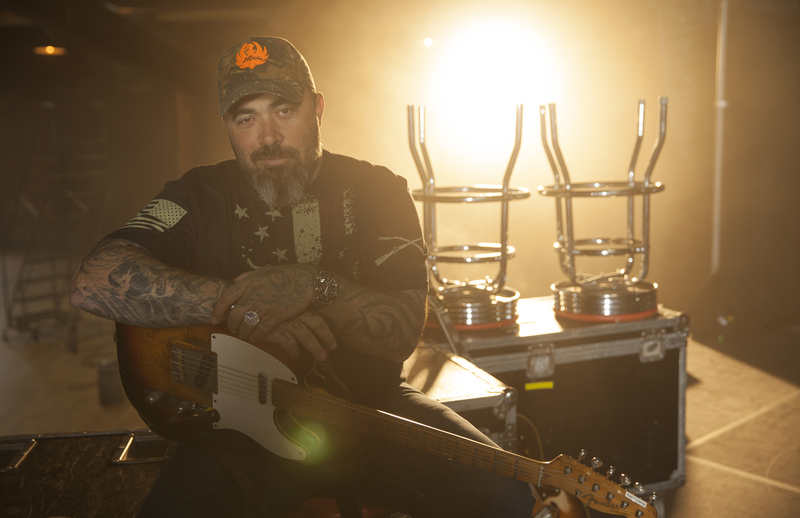 The former Staind front man first made his country debut in 2011 with certified gold single “Country Boy” followed by the release of his first full length solo album, The Road. “Country Boy” featured Charlie Daniels on fiddle and a booming verse from George Jones as well as Chris Young striking a balance between classic and modern country.